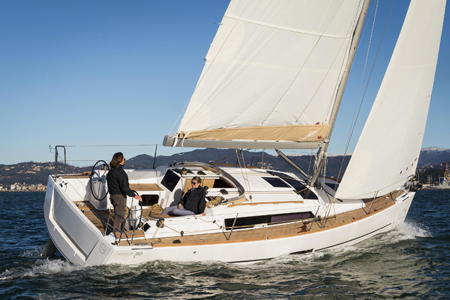 The new Dufour 310 Grand Large offers a new direction for the range – twin rudder blades and a lifting keel option. This new model was previewed for the first time at Paris Boat Show in December 2013, since then it has been a big hit! Dufour are aiming to introduce something a little different with this scaled down model, she is fast, well balanced and well mannered, the Dufour 310 Grand Large offers a unique sailing experience, for a yacht of this size. The 310 reveals surprisingly practical features on a smaller boat. Taking inspiration from the performance range, the focus has been placed on the short handed, and single handed, sailing ability. There is a self tacking jib, twin wheels and twin rudders that will offer owners the best handling, visibility and maneuverability possible on a 31 foot boat. The Dufour 310 Grand Large offers an internal layout with two cabins, galley, saloon area and ample size head. There is two linear seating areas that offer seating for six people around the saloon table; with the L shaped galley to portside it is a very sociable layout, the cook is also involved in the conversation. There are numerous natural lighting points and the bright, fresh interior give the impression of a much larger yacht. When open, the double doors into the forward cabin draw the eye forward increasing the feeling of space and volume. We now have a very top spec Adventure version of the 310 in stock here in Plymouth, if you would like to come and view the boat please contact our sales team! Finance available, part exchange considered!